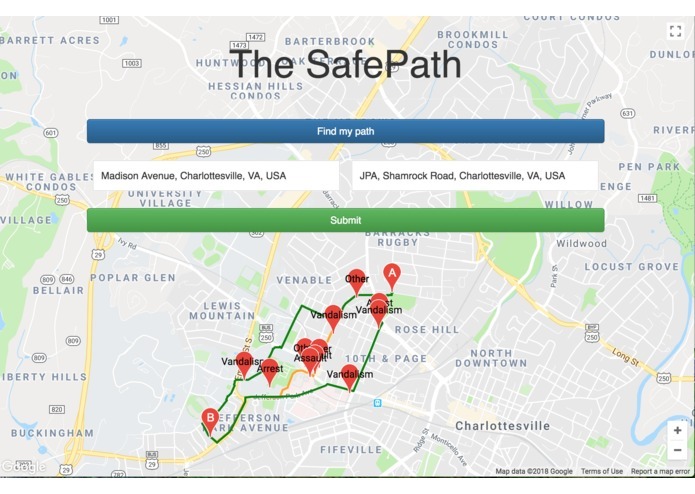 When walking back from a late night at the library or an event, we can rely on a common map application to give us the fastest route home, but will it be the safest route? Our goal was to present multiple routes to the user so that they could make an informed decision about how to get to their destination. The web application takes in user inputted origin and destination addresses (aided by Google's autocomplete api) and overlays multiple routes between the endpoints. Using crime data in the area, the routes are color coded based on how many crimes have happened in close proximity to the route. Lack of working API's for crime data.